The ProForm Pro 2000 Treadmill has been rated a “best buy” in various treadmill reviews and we’d have to agree. The ProForm 2000 is a solid machine in every way. ProForm fortified this treadmill with durable construction ensuring a 350 lb user weight capacity plus lifetime warranties on the frame and motor. The ProForm 2000 is a runner’s dream with a large deck and running surface, speed up to 12 mph, 15% incline, and most impressive and unusual, a 3% decline capability. On top of that, the ProForm Pro 2000 Treadmill is loaded with extras like an included Polar heart rate chest strap, MP3 compatibility, cooling fan, 32 programmed workouts, and access to iFit Live. The ProForm Pro 2000 Treadmill provides endless options for workouts and is going to stand the test of time. Click here to check the price of the ProForm Pro 2000 Treadmill on Amazon. ProShox Cushioning to maximize joint protection and to provide superior comfort. SpaceSaver design with EasyLift Assist allows the deck to be folded for easy storage. iFit technology compatible to enjoy workouts powered by Google Maps. Get workouts tailor-made by Jillian Michaels or customize you own fitness program. Speed from 0-12 mph with the 3.5 CHP Mach Z Commercial Pro Motor. Compatible music port for iPod and MP3 player. CoolAire fan with 2 speeds to keep you cool during your workouts. Amazon offers free scheduled delivery of the ProForm Pro 2000. And assembly is relatively easy and should take less than two hours. ProForm is a well-established company in the health and fitness industry. They have a good reputation for delivering highly professional and budget friendly exercise equipment. Besides elliptical machines, they manufacture many other pieces of fitness equipment including rowing machines, treadmills and hybrid trainers. We’ve shared the great features of the ProForm Pro 2000 Treadmill, but we love that overall it’s a strong and durable treadmill. It has many great features and some things you aren’t going to find from the competition. The ProForm Pro 2000 Treadmill has some extras you will not find on any other treadmill at this price range…guaranteed. First, almost all treadmills at this price range have incline capability up to 15%, as does the Pro 2000 Treadmill. However, this treadmill also has decline. You can run or walk at a 3% decline on this treadmill, something I haven’t seen on other treadmills at this price. 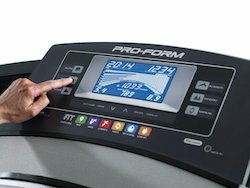 Other extras that make the ProForm Pro 2000 Treadmill a solid purchase are the 32 programmed workouts. That’s also more than I’ve seen on competitor models at this price range. Additionally, for a small monthly fee you can subscribe to iFit Live and get an almost endless number of workout options. Not too much to complain about here. There are some reports online discussing problems with delivery and customer service. We would recommend you buy from a reputable distributor like Amazon.com. Find a retailer with a history of good customer service and a good delivery record. For the price, the ProForm Pro 2000 Treadmill is an awesome machine. Honestly at this price range and even for treadmills costing $1,000 more, this is probably the winner. It has good construction, a strong motor, a large running surface and tons of extras like the decline feature, 32 programmed workouts, and iFit Live capability. Highly recommended.